With US equity indexes closing broadly higher, the VIX was lower for an eighth consecutive day, settling -5.3% @ 17.42, having flash-printed to 16.34. Near term outlook is for continued equity upside, and that will likely equate to VIX continuing to cool, the 14/13s now look briefly possible if sp'2060s. 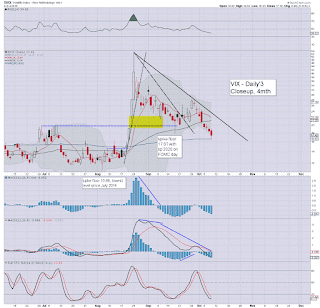 VIX is set to remain subdued for another week or two. No doubt the VIX will break above the 20 threshold in late Oct/early Nov', but for now... there is no sign of the cooling trend ending. *I have ZERO interest in being long volatility in the near term. *Closing hour action: further chop... with a nano down wave.. but broadly... nothing for the bears to be getting excited about. With a clear break above the 2K threshold.. along with the 50dma... a rather strong day for the bulls. Market is set for another net weekly gain.... and onward to 2040/60.... where the bears last line of defence is... the 200dma. Really, for me.. that is the only thing that matters now. Either the market sees an epic FAIL within the next few weeks - on the order of importance of late 2007/early 2008.. or.... we keep on pushing... and don't stop. .. for now.. I'm guessing we do fail in the 2040/60 zone.. but that is arguably 'hope' on my part.. rather than anything grounded in time machine/fortune telling. Nothing good.. and market has knocked the stock -3% or so. Certainly.. not apocalyptic... but it sure ain't pretty either. The Cramer is trying to sweet talk the Alcoa CEO.... as expected. 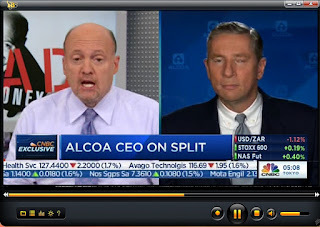 I actually like Alcoa (I've a high respect for companies that actually make real stuff).. but clearly.. AA seems a stupid long trade in the short/mid term, so long as commodities remain broadly weak... and there ain't no sign of higher prices for many... many months. US equity indexes are set to close moderately higher.. but most important of all, above the psy' level of sp'2000.. and the 50dma. 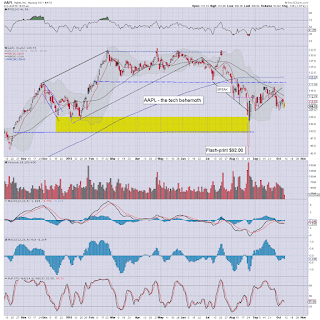 Next soft target is the 2015/20 zone.... but equally probable... the 2040/60 zone. Until a monthly close above 2050.. the bull maniacs still face a serious threat. 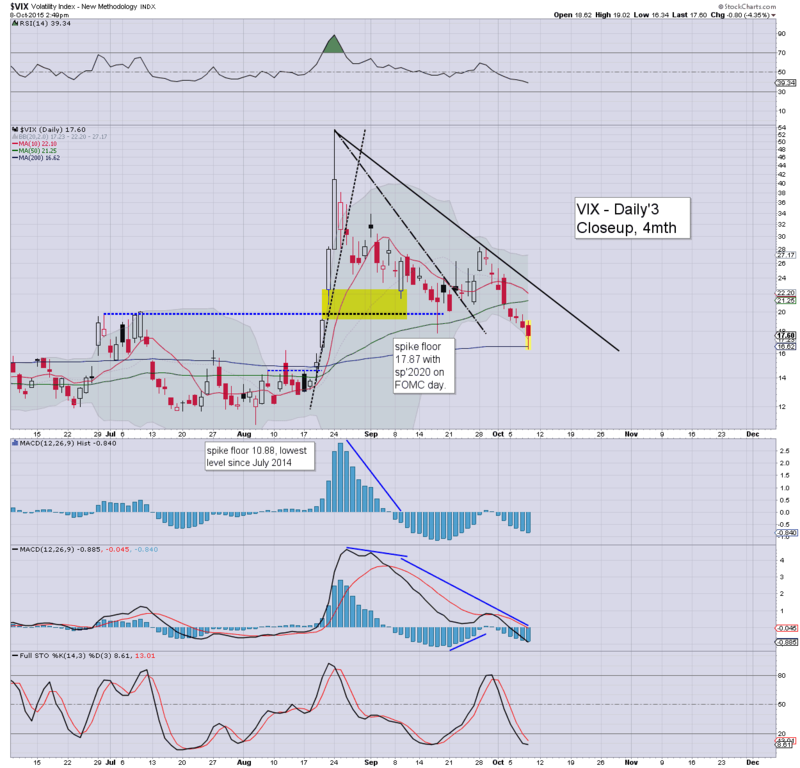 *VIX is set to close lower for the eighth consecutive day.... having flash-printed to 16.34. So.. we broke to the upside.. as seemed probable.. and we're now set for a straight run to the 2040/60 zone. I can't emphasise enough the importance of the monthly 10MA. I realise others have different thresholds.. but for me.. that is the grander 'line in the sand'. notable strength: NFLX +5% in the $113s.. as Jessica Jones is on her way. 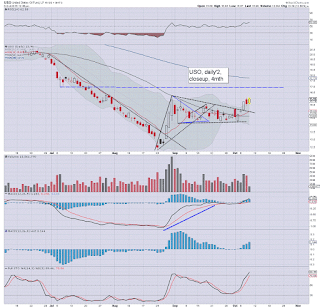 ... ohh, and we have Alcoa earnings at today's close. 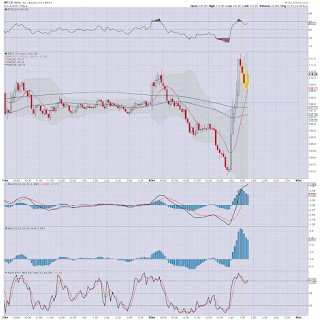 3.14pm... WTIC Oil has provisionally broken the $50 threshold.. to 50.07.... next target is the 55/57 zone... which is a clear 10% higher. .. and that is viable within days as there will no doubt be a LOT of bullish chasers and bears who will need to cover at any price. 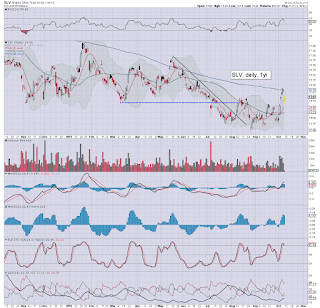 NFLX still building powerful gains, +5.7% in the $114s. US equities continue to largely churn ahead of the fed press release. Mr Market is no doubt looking for an excuse to trigger the sp'2000 short-stops.. of which there are very likely a significant number. Any daily close in the 2000s would offer clarity of a straight run to the 2040/60 zone. Well.. little to add... lets see what the market makes of the latest nonsense from PRINT central. ... on reports it will raise the price of its monthly package by $1. I've long thought NFLX is under-pricing itself, and given another 3-6 mths.. then talk will be when the next price hike occurs. 2.05pm. 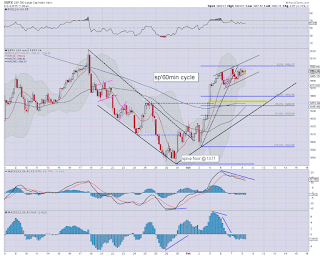 .sp'2002.. next soft target is 2010/15.. . after that.. 2040/60 zone. Again, the bigger issue is whether a monthly close >2050... but then.. you regular readers know that.. yes? 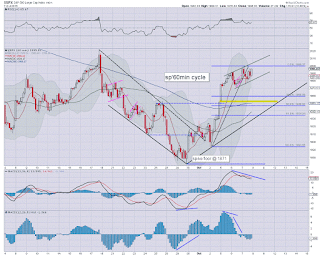 A green candle is not to be taken lightly.... bodes for 2040/60.. before end month. 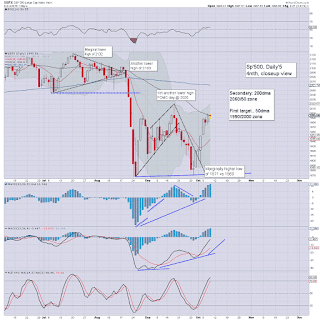 The market is clearly in a holding pattern ahead of the next FOMC minutes release. 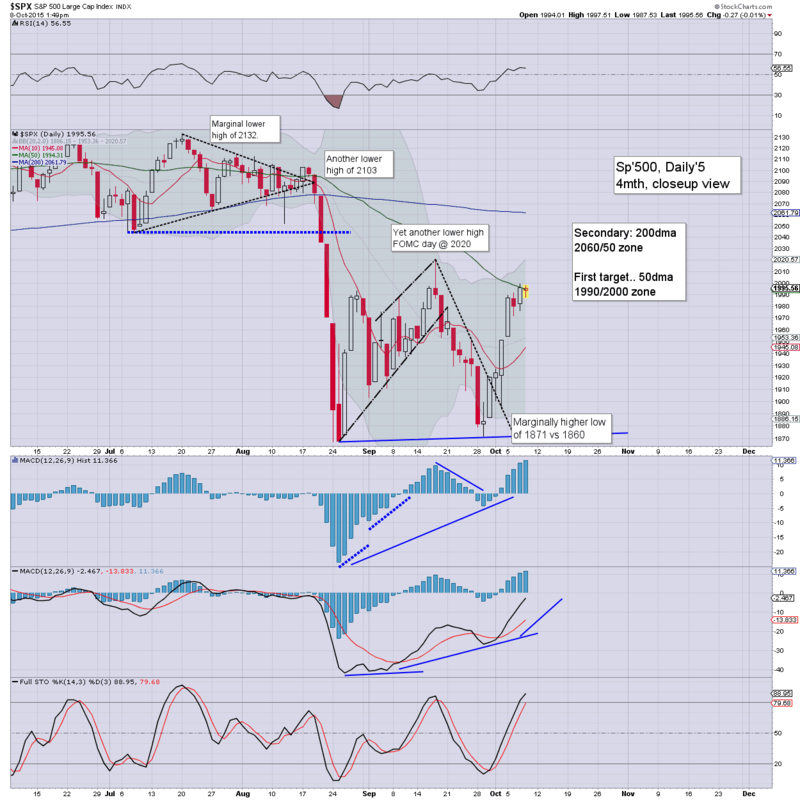 In the scheme of things, it really should not matter, but it does look like the market is going to either break >sp'2000... or make another attempt to retrace to the sp'1950s. Right now.. the former looks more probable. 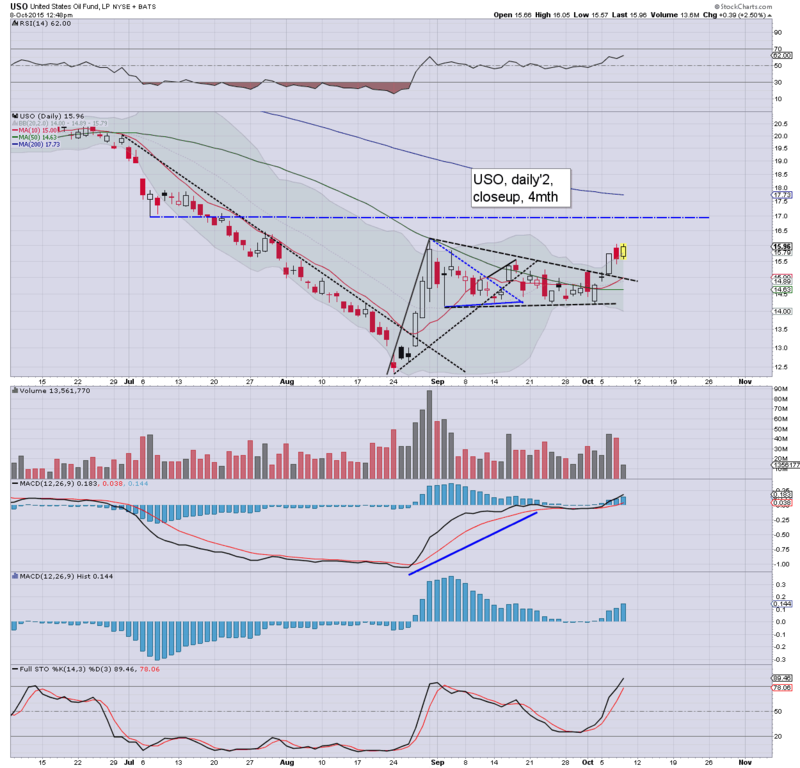 *notable strength in Oil, +2.6% in the $49s. 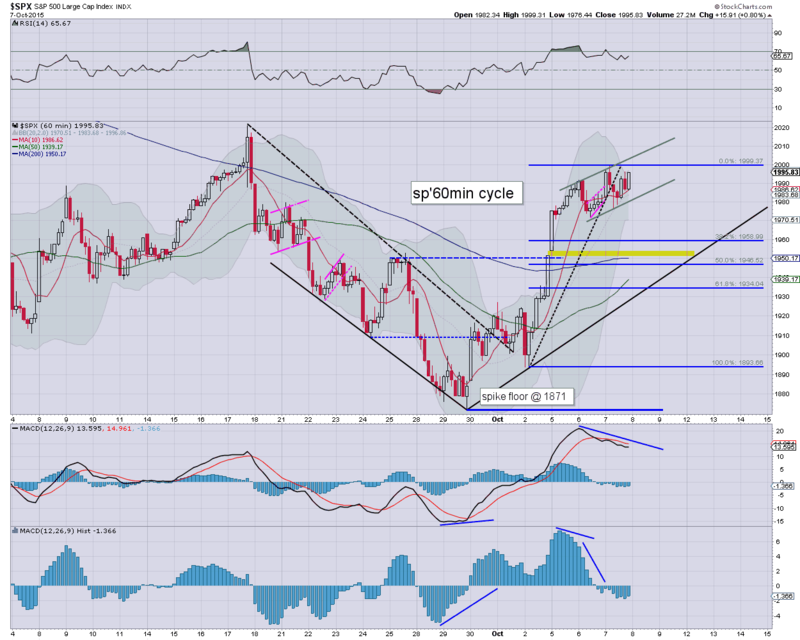 A break above the $50 threshold will give the broader equity market the excuse for another week or two higher.. to the sp'2040/60 zone. The smaller 15/60min cycles favour the equity bulls this afternoon. I realise some are calling for a key top today/tomorrow (hi Bradley followers)... but I don't agree. The 2040/60 zone looks a far more natural level to max out. back at 2pm.. for the Fed press release. 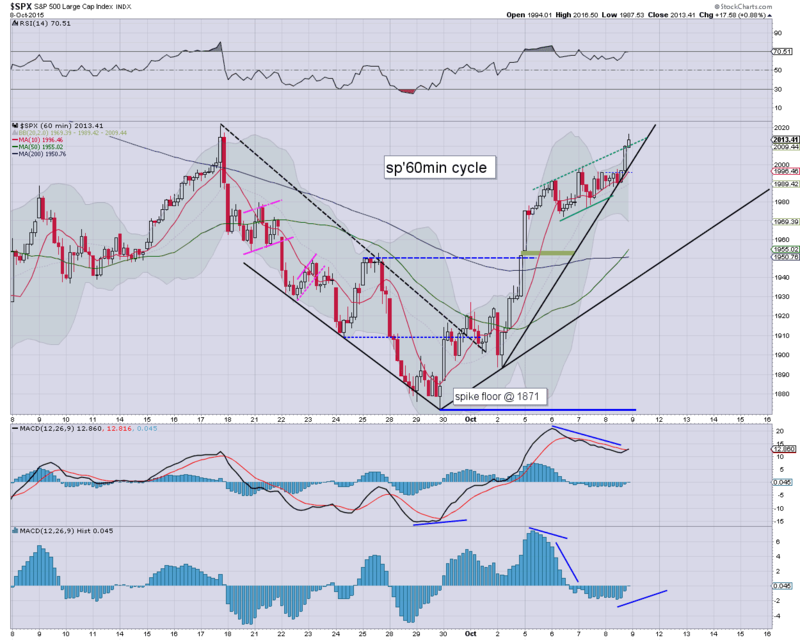 US equities remain in chop mode... but increasingly leaning on the more bullish side. Indeed, with a FOMC minutes press release due at 2pm, the market will have the excuse to break into the sp'2000s this afternoon... opening the door to the 2040/60 zone. Unlike the last FOMC minutes release (when sp' peaked @ 2020)... I'd guess we see renewed upside this afternoon. Cyclically.. we're due to push higher later today. First soft target is the 2010/15 zone. US equity indexes remain negative, but there is still a complete lack of any sig' downside power. VIX is reflective of a market that has little concern in the near term, +1% in the 18s. USD is starting to cool, -0.1% in the DXY 95.30s... and that is no doubt helping Oil hold moderate gains of 0.4% in the $48s. From a pure cyclical perspective, the market will be increasingly prone to rally. 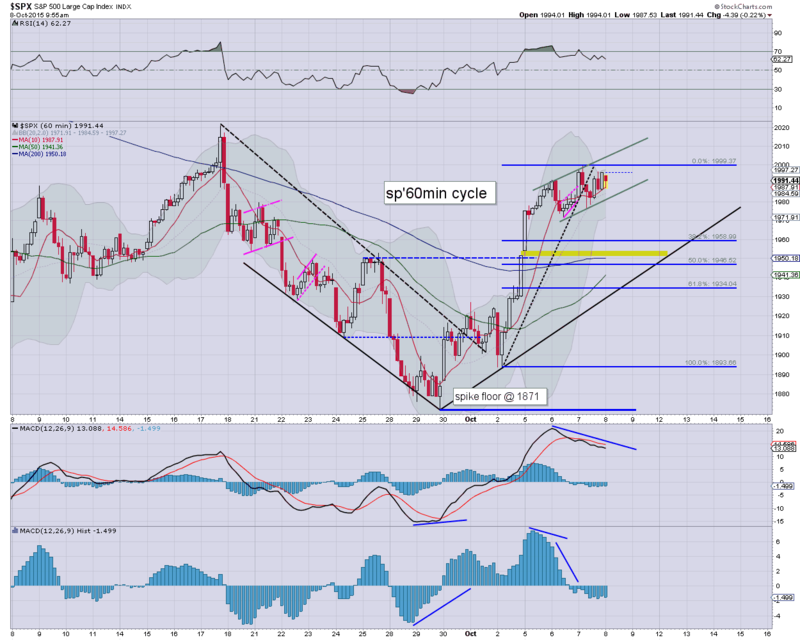 With the FOMC min's at 2pm... a break >sp'2000 looks.... probable. 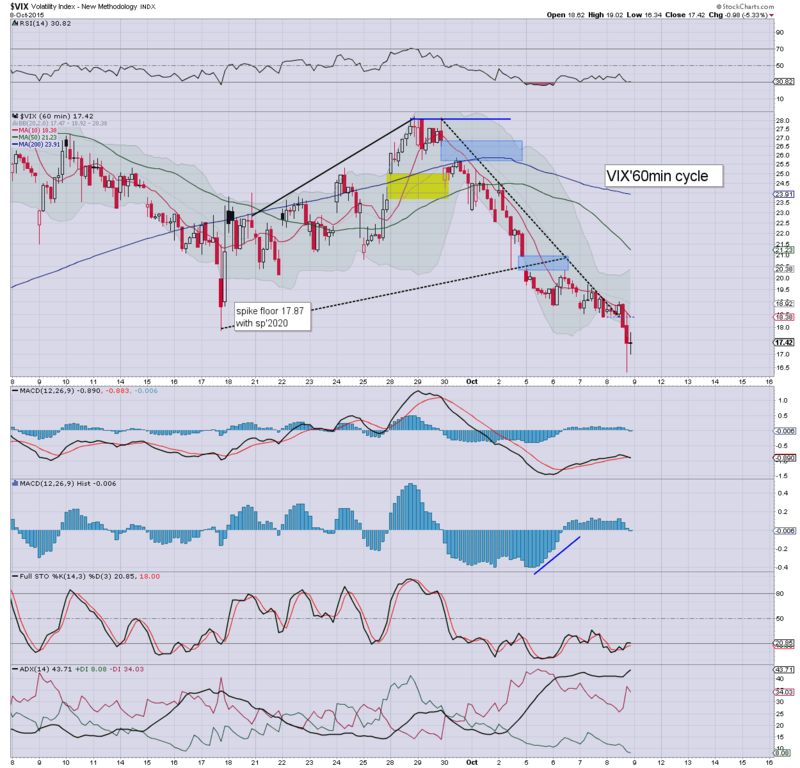 The daily chart is pretty ugly... certainly relative to the broader market. US equities open moderately weak, and there is a distinct lack of any downside power from the equity bears.. as reflected in the VIX, +1% in the 18s. The precious metals are on the slide, Gold -$5, whilst Silver is -2.5%. Oil is battling to build early gains of 0.5% in the $48s. What should be clear... despite all the negative news - not least from Deutsche Bank (DB) and Credit Suisse (CS), the market is holding up very well. 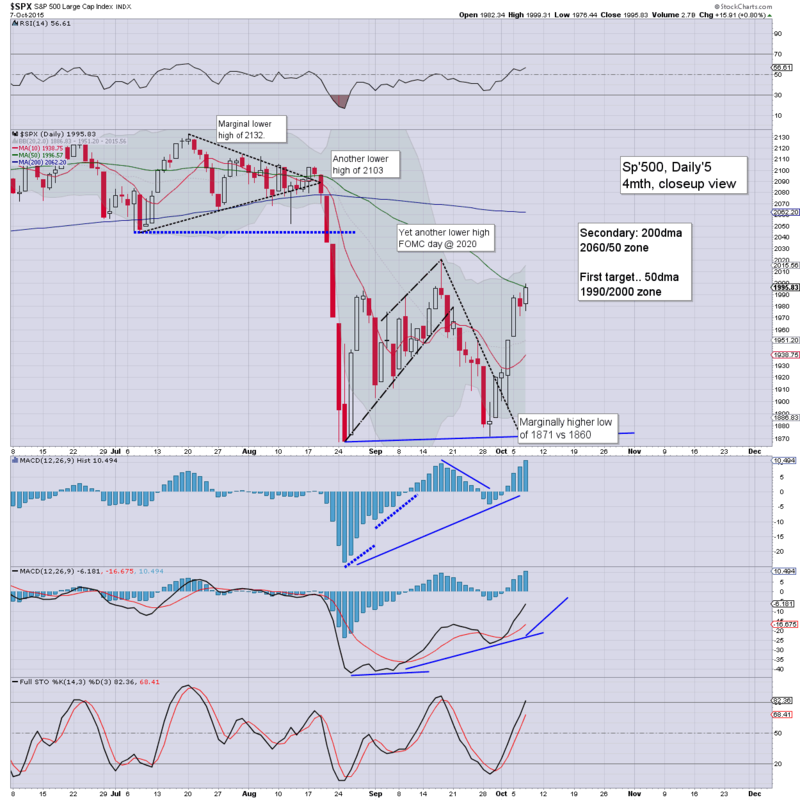 If the FOMC mins' is taken as 'fine' later today.. a daily close in the sp'2000s will be due. Broadly.. the market still looks headed higher.. into the 2040/60 zone. That sure don't look pretty.. obvious target would be the psy' level of $100. Good morning. US equity futures are moderately lower, sp -5pts, we're set to open at 1990. 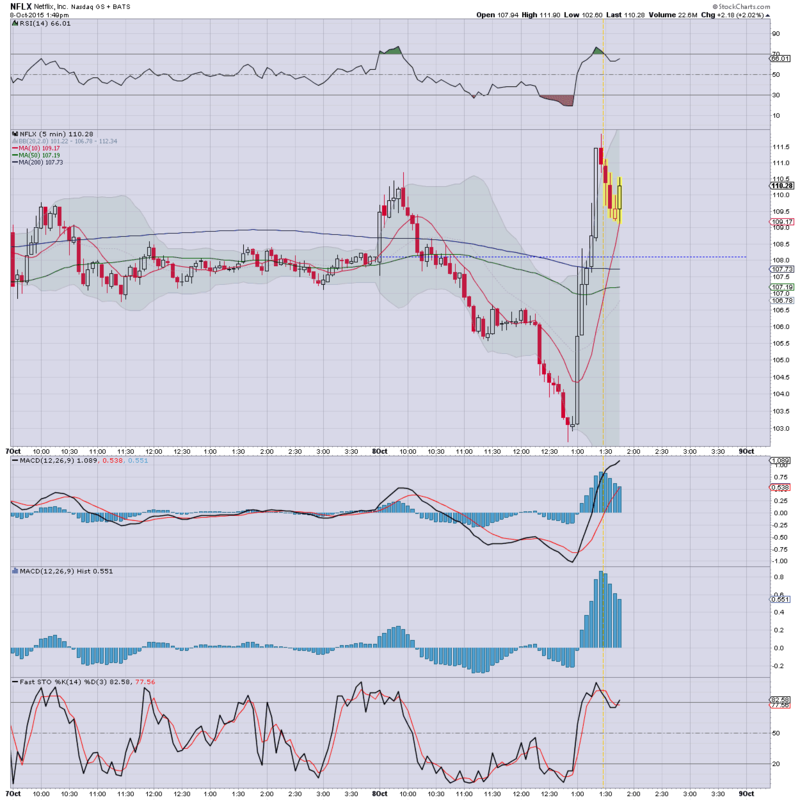 USD is -0.1% in the DXY 95.40s. Commodities are mixed, Gold -$2, with Oil +0.2% in the $48s. Today will be about whether the market can use the FOMC mins (due 2pm) press release as the excuse to rally into the sp'2000s.... or... to unravel toward the sp'1950s. Which way are we headed? Very difficult to say... but I would again note that even if we do cool to the 1950s.. 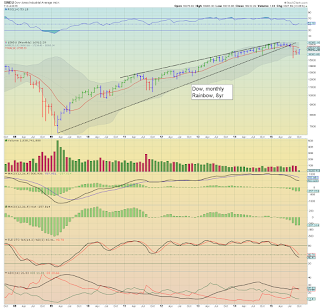 I'd still be looking for a subsequent move into the 2000s. China is back up and running... settling +3.0% @ 3143. 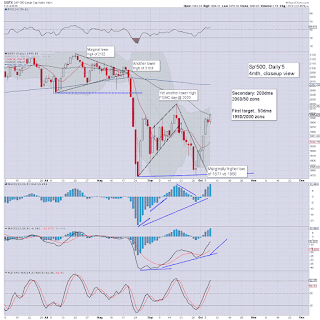 8.32am.... indexes starting to slip... sp -10pts... 1985.... but that is still a full 30pts short of first soft target. notable weakness: TSLA, -1.0%... remaining broadly weak. 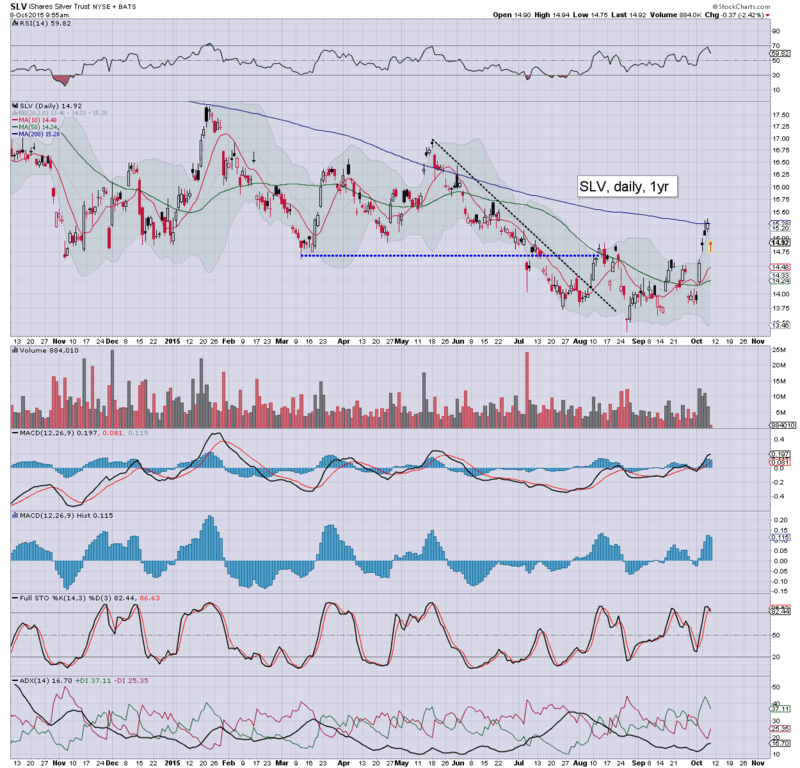 .. ohh, and we have Alcoa (AA) earnings at the close... so that will be one to watch. I'd guess the CEO will appear on clown finance TV in the 4pm hour to try to instill confidence that commodities can't go any lower. Whilst equities continued to battle higher from the recent marginally higher low of sp'1871, the ultimate issue remains... is the correction done? 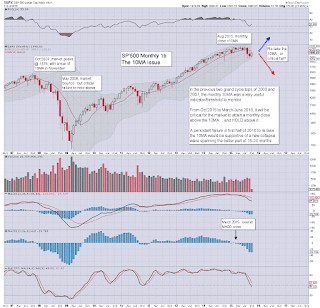 In many ways, the monthly 10MA remains a very simple, but useful threshold to watch. As ever, how the market closes the month is what really matters. 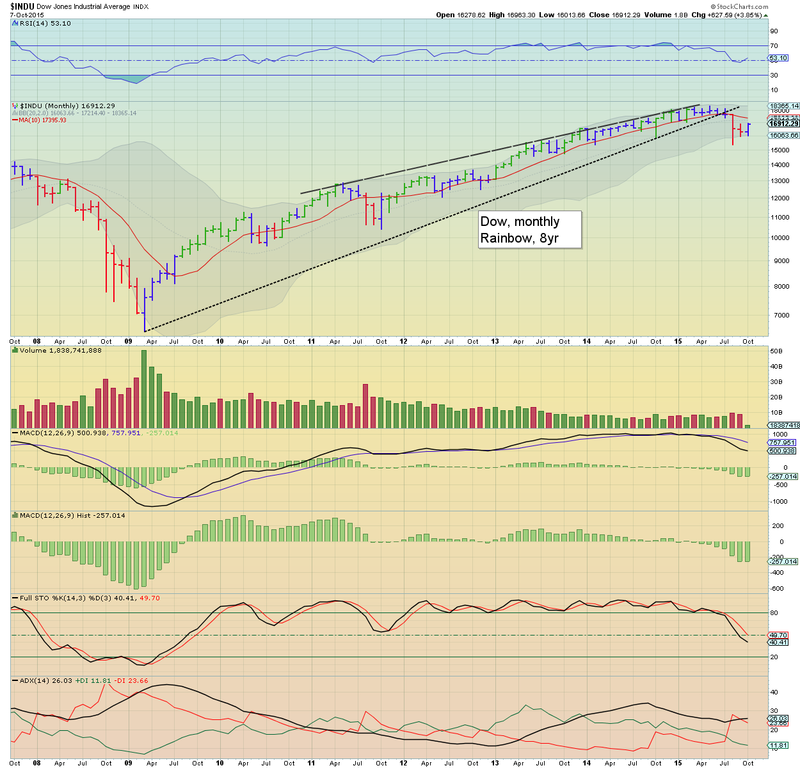 *it is notable that with the break into the 16900s, the Dow monthly 'rainbow' candle has turned from red to blue. 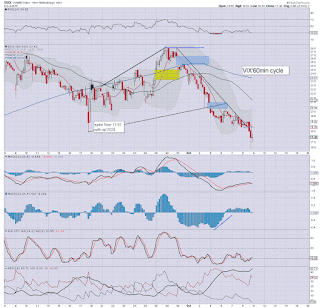 The equity bears should be at least moderately concerned at this warning of a mid term turn. The '10MA' issue will be something I'll regularly highlight in the months ahead. Even if the market closes October under the 10MA... there is of course always the threat it will re-take it in Nov'... or later. 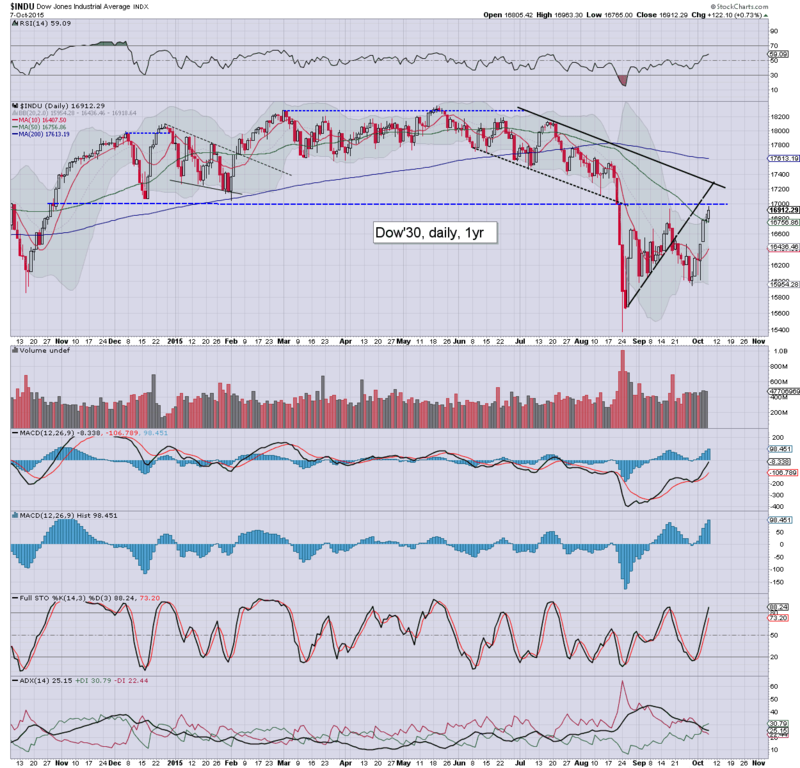 Secondary 1600/1575 - an effective test of the old double top of 2000/2007. *there are three fed officials on the loose.. notably.. Bullard at 9.30am. I am aware a few out there are looking for another market top at tomorrow's FOMC minutes release. I kinda understand why they think that... after all, the last top was 2020, and then fell all the way to 1871. 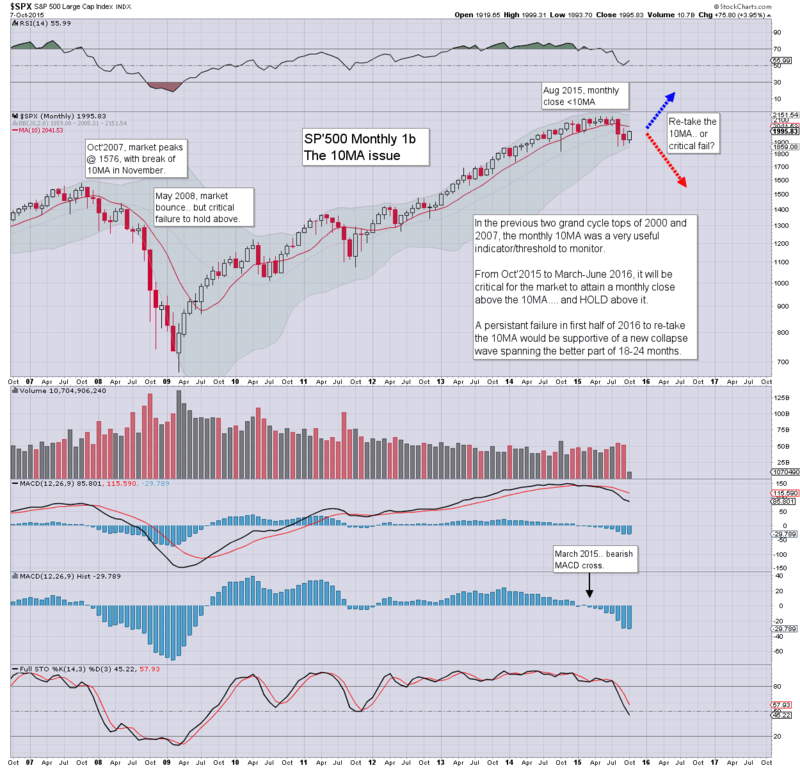 My best guess is that the market will rally into the sp'2000s, and get stuck in the 2040/60 zone. From there, I will likely attempt a re-short. US equities closed broadly higher, sp +15pts @ 1995 (intra range 1976/99). The two leaders - Trans/R2K, settled higher by a significantly 1.4% and 1.7% respectively. 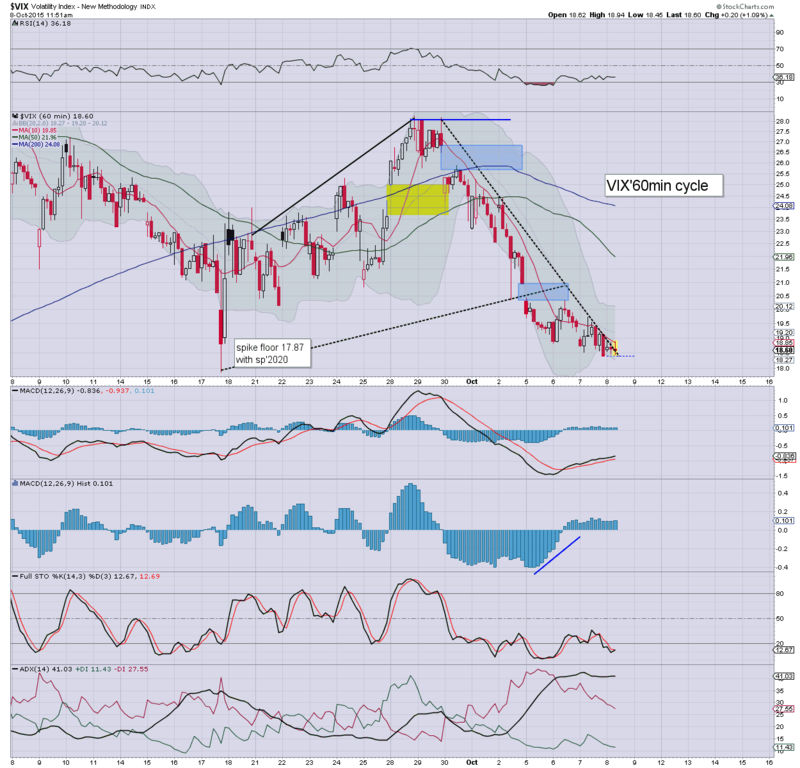 Near term outlook threatens a retrace to the 1950s, but the 2040/60 zone looks probable within the next 7-10 trading days. 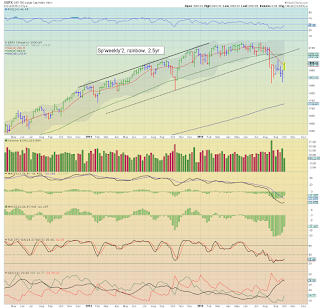 All the US indexes are fast approaching old (broken) supports. 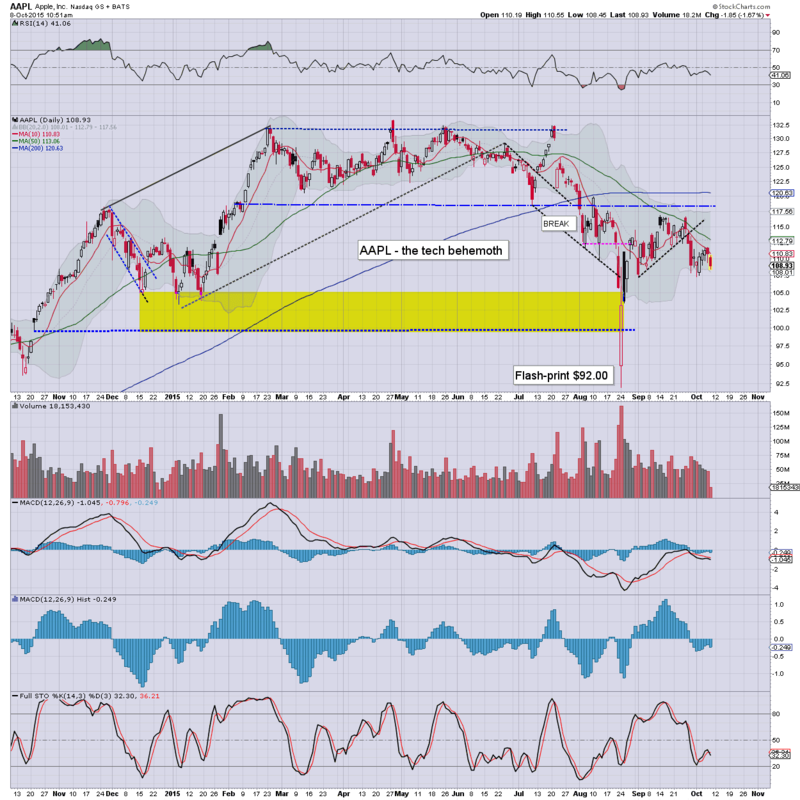 Best guess..the market maxes out across the next 1-2 weeks.. before resuming lower. 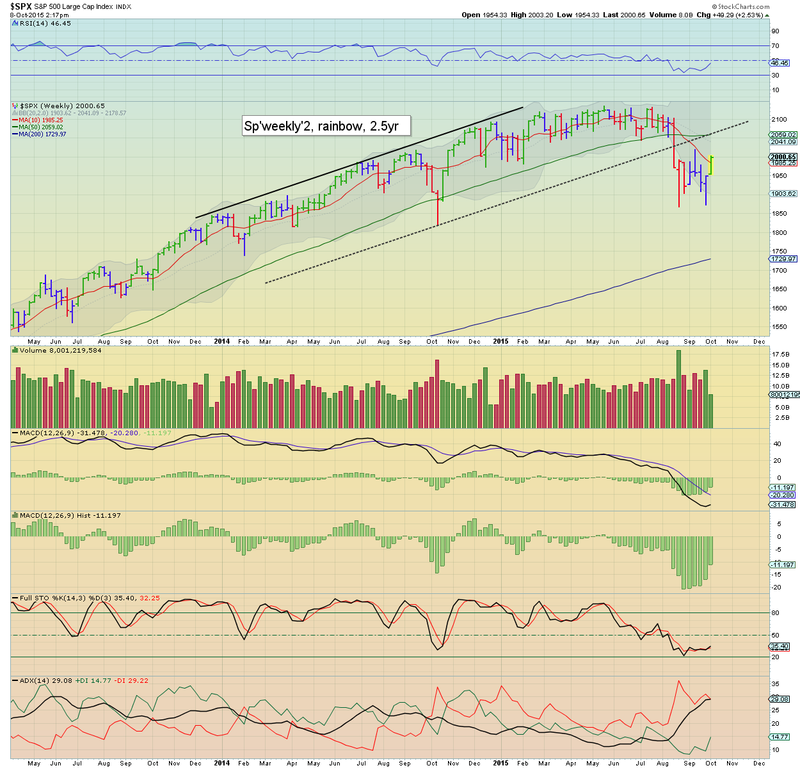 Whether we break below the Aug' low of sp'1860... difficult to say. 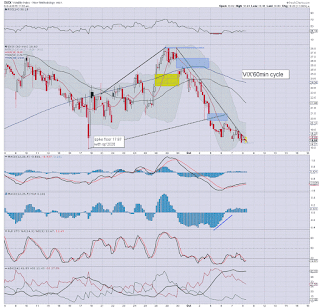 *the bigger monthly charts would suggest much lower levels across the months ahead.